Homemade Orange Ginger Pecan Granola is so delicious! It is nutritious, heart healthy and is wonderful with Homemade Greek Yogurt. It’s out of hand, really. So, now only do I make my own Homemade Thick Greek Yogurt, I also make my own Granola to put on top of my Homemade Thick Greek Yogurt. There was a little Greek Gyro stand alone restaurant by my house in Florida and one day on my way home from work, I stopped in to pick up dinner. Half the patrons were seated with delicious looking bowls of yogurt, topped with Granola, Dried Cherries, Nuts and other delicious looking toppings. Instead a Gyro, I ordered the bowl of Homemade Yogurt with Fruit and Nuts. Oh my gosh, the fresh Greek yogurt with granola, fruit and agave, was so delicious. It was more like a treat, a dessert, kind of. It quickly became my new favorite lunch. Luckily, this place was close enough to my office, so that I could sneak out and grab some for lunch and get back in enough time to enjoy my Yogurt and then get back to work. I happen to have some of Bob’s Red Mill Rolled Hot Cereal in my house because I bake a lot of Sourdough Bread, so rather than gathering some oats from my local Winco Bins (oh my gosh, if you have a Winco in your area, check out their bins, they have soooo many goodies in bulk), I grabbed a bag and set out to make some Homemade Orange Ginger Pecan Granola. 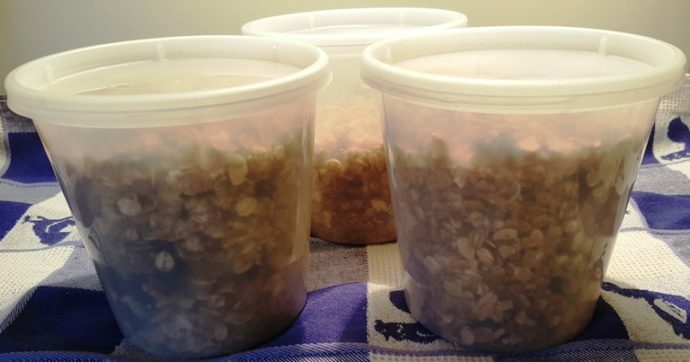 You can order bags of Bob’s Red Mill Rolled Hot Cereal on line, which is really cheap, or you can grab all your ingredients from a bulk supplier. The Bob’s Red Mill Rolled Hot Cereal contains rolled oats, wheat, rye, barley, triticale and a little flaxseed, so gather together four cups and you will be good to go. Chop the Pecans and add them to a Large Mixing Bowl. Add in the Oats, Shredded Coconut, Candied Ginger, Orange Peel, True Orange Ginger and Sea Salt. Mix them all together and set aside. The Pitted Dates will get chopped added later on after the Granola has cooked a bit. In a small saucepan, heat the Coconut Oil and the Honey. Once melted, add the Brown Sugar and stir to combine. Remove from heat. Pour the Wet Mixture into the Mixing Bowl over the Oats Mixture. Use a Spatula and make sure that all pieces are completely coated. Pour the mixture onto a Half Cookie Sheet and spread out evenly. Pop the Cookie Sheet into the oven and cook, stirring the mixture, every ten minutes. Rough Chop the Dates. Remove the Granola from the oven and stir in the Chopped Dates. Bake them for an additional 5 minutes. Allow the Homemade Orange Ginger Pecan Granola to completely cool and then break it up into Clusters. 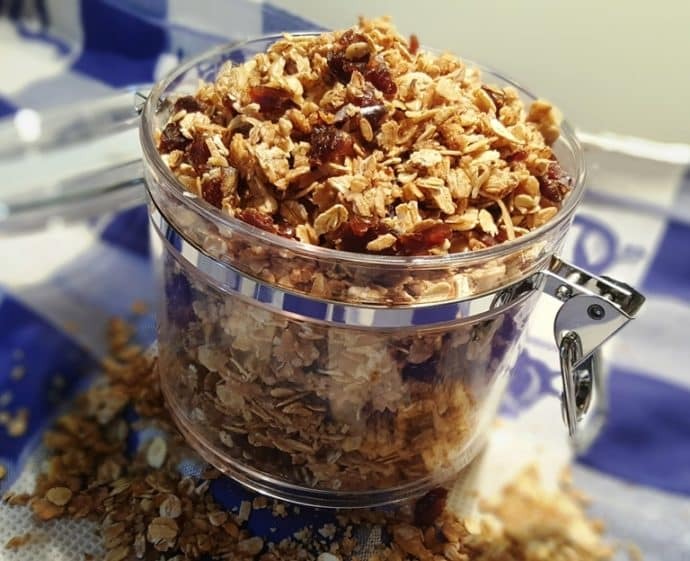 Use some air tight Mason JarsMason Jars or Reditainer Freezer Containers to store the Granola, so that it will stay nice and fresh. The Reditainer Freezer Containers are nice because they are cheap, BPA free and offer a tight seal. This Homemade Orange Ginger Pecan Granola is so versatile. I make it different each time. Sometimes I add Raisins and Cinnamon with Cashews, Cherries with Vanilla and Almonds, Mixed Fruit with Raw Pumpkin Seeds and the list goes on. Have fun and mix it up. Preheat oven to 300 degrees. Rough chop Nuts and place in large mixing bowl. Add Oats, Nuts, Coconut, Salt, Ginger and Orange Peel. 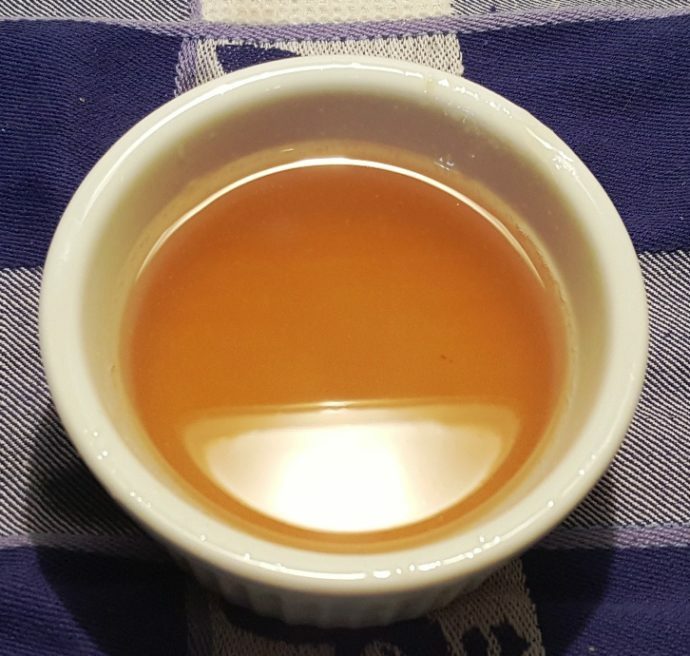 In small saucepan (or microwave), heat the Coconut Oil and Honey until melted. Add Brown Sugar and stir until combined. Pour wet mixture over Oat mixture and combine well, making sure all dry ingredients are coated. 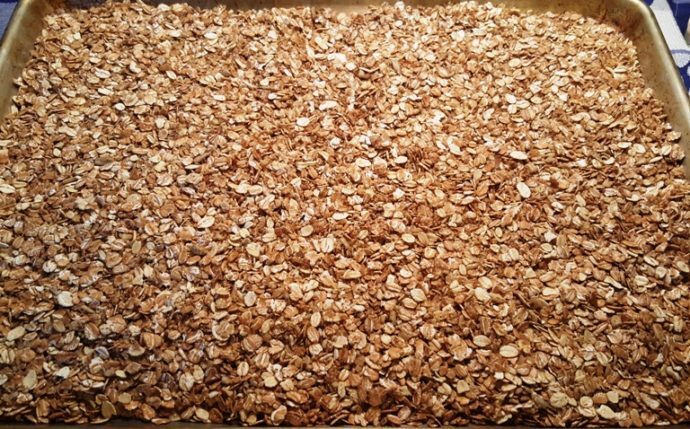 Place Granola mixture onto cookie sheet and spread evenly. 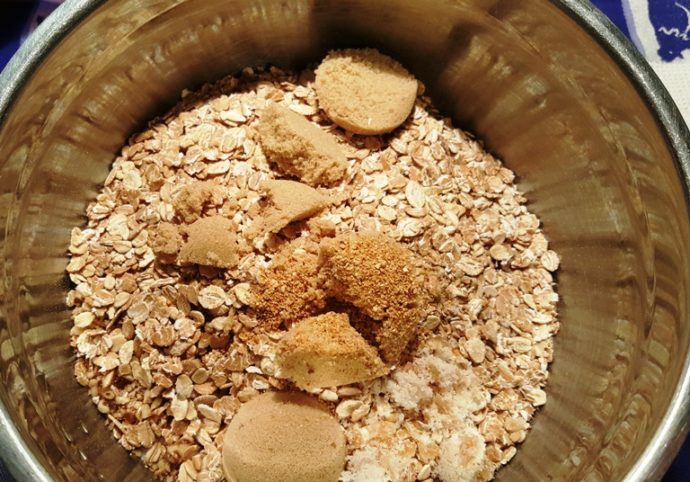 Bake for 25 minutes, mixing the Granola every 10 minutes. Remove from oven and mix in the dates. Flatten mixture again and back for an additional 5 minutes. Allow mixture to completely cool. Break up into clusters and store in an air tight container. Season the granola anyway you like and make it different each time. 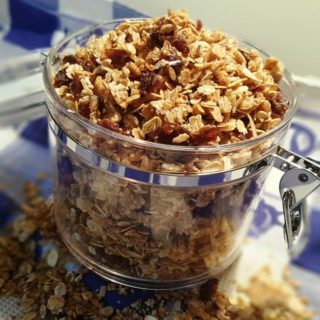 PIN this Homemade Orange Ginger Pecan Granola! I’ve been cooking mine for 2 hours and it still isn’t dried out totally and crunchy! 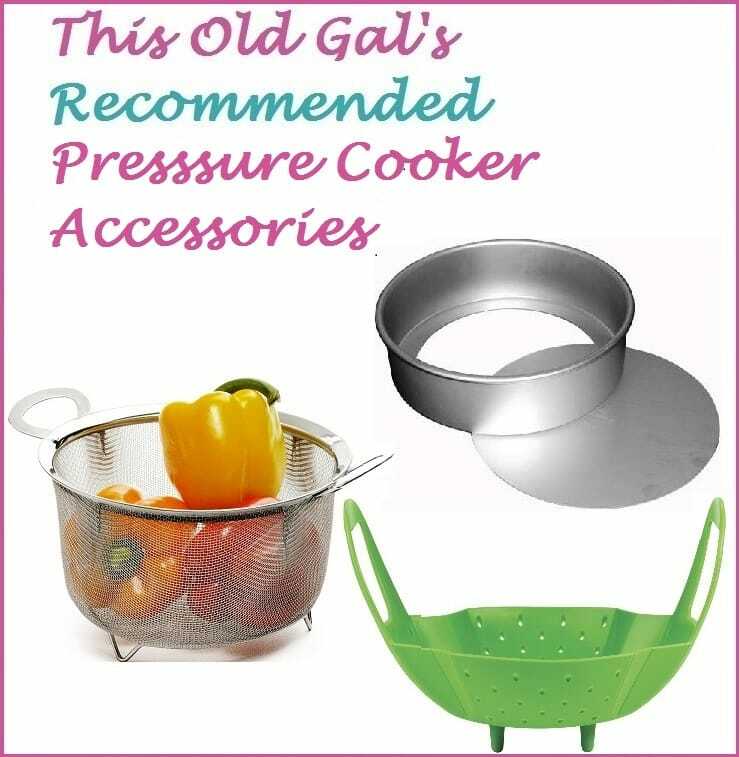 I drained it for about 10 minutes in a strainer. It’s tasting delishous, just isn’t dry yet, so I’ve still got it in the oven! 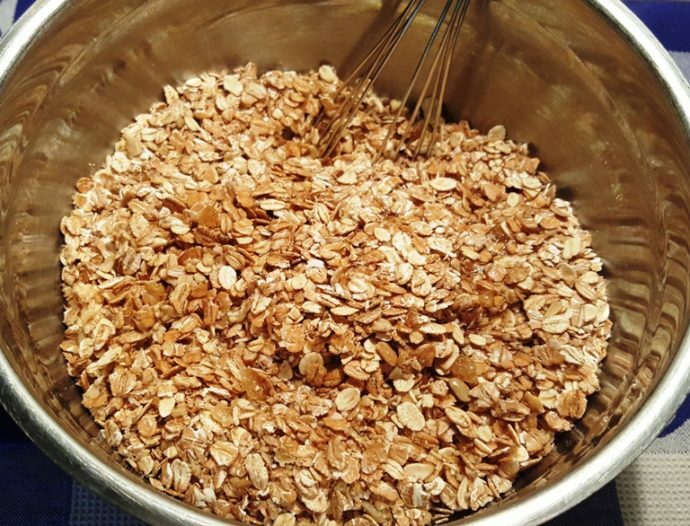 I’ve made granola before, but I’ve never soaked the oats. I was wondering what the reason is for soaking? They did absorb and swell, so it makes more! But is there a health reason behind the soaking? Just wondering! I’m wanting to be as healthy and nutrition conscience as possible! Thanks! I am not sure why the oats are not dry after so long. If you don’t soak, the granola will be very hard. 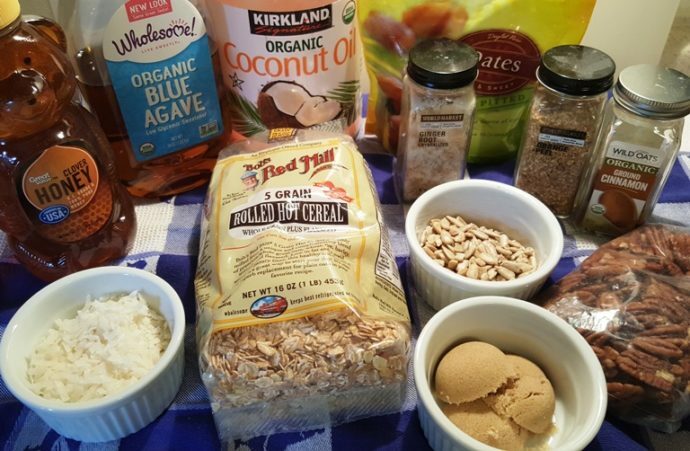 Where does it say in the recipe that you need to soak the oats? Recipe instructions do not mention soaking oats. Can you share this procedure. If I could give this recipe 10 stars I would!!! 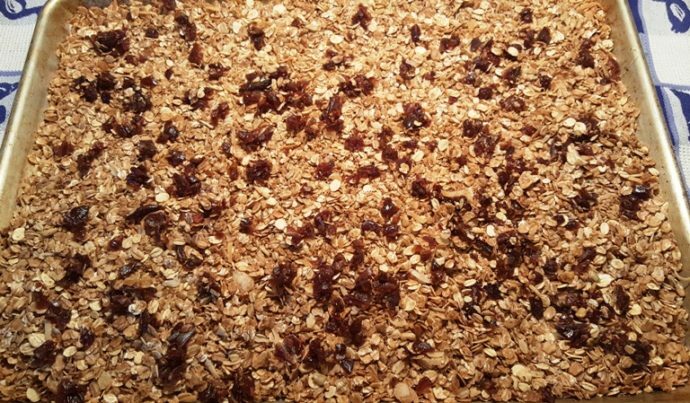 I have been making my own granola for years from a recipe my mother in law gave me. Yours sounds very good.